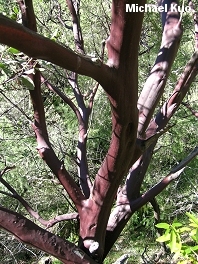 California shrub with distinctive red-brown bark and spreading branches; sometimes attaining "tree height." 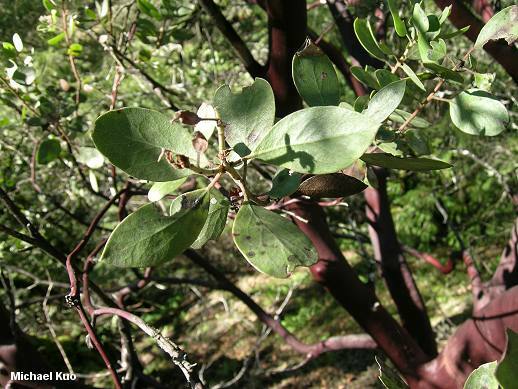 Whether or not California's manzanita qualifies as a "tree" is up for grabs . . . but many mushrooms are mycorrhizal with it, so it is an important bush (shrub? tree-let?) for mushroom collectors. 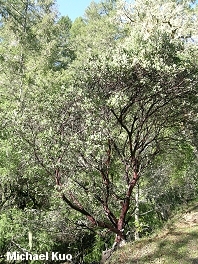 Habitat: Usually in dry areas; often on slopes and in canyons; mixed with hardwoods and/or conifers; California. Stature: A shrub or shrub-like tree; to 20 feet high; trunks to 6 inches in diameter; branches spreading outwards. Leaves: Evergreen; to 2 inches long; unlobed; not toothed; pale green. Fruit: A small white to reddish brown berry. Amanita gemmata; Leccinum manzanitae; Tricholoma pardinum; Tricholoma saponaceum; and many others.